The Wemos battery shield seems an easy way to start battery feeding your Wemos D1 mini, but after using one for a while, it became obvious it is not for any serious battery use, mainly for two reasons: It is not efficient in using the battery power and the Wemos D1 itself is not efficient to be used with batteries. Apparently he 5410 cranks up the battery voltage to 5 Volt and feeds this to the 5 Volt pin of the Wemos D1. Though this makes the Shield handy to use in combination with other shields that may rely on the voltage coming from the 5 Volt pin, it is likely a less efficient way of using the battery power as opposed to bringing it to 3.3 Volt directly via an LDO. There is not much technical information on the battery shield, but I did find a circuit that seems to almost come right out of a chinese datasheet of the TP5410, in which several configurations are shown. Studying the circuit it seems that the 5 Volt coming from the USB, is connected to the 5 Volt pin of the shield, only through an SS32 Skottky diode. In itself that is no problem, unless one decides to use another input to that connector, e.g. a solar cell. 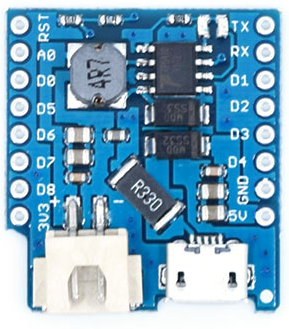 The Wemos D1 mini has an RT9013 LDO regulator that has a max input of 5.5 Volt with an absolute Max rating of 6 Volt. 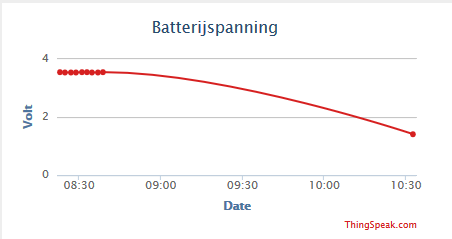 Anyway, I hooked up a 720mAh Lipocell to the battery shield and uploades a sketch that measures the battery voltage (through a resistor on A0) and did an upload to Thingspeak every minute, being in deep sleep in between, just to see how long it would last. My first observation was that the shield apparently does not fully charge the LiPo cell. It came to a max of 4.05 Volt before it switched to ‘Standby’. I made sure by using a Multimeter and indeed, only 4.05-4.1 volt on the cell. It worked pretty well after that, uploading the voltage to Thingspeak for 5 days and 5 hrs, when suddenly it stopped, with the battery voltage at 3.56 Volt, far above the 3 Volt minimum charge of a LiPo. Strange. The RT9013 has a drop of 250mV at 500mA, so even at 500mA the voltage on the ESP8266 still would have been 3.31 Volt. I have fed the 8266 with as low as 2.9 Volt and it was still working, so this was a strange finding. 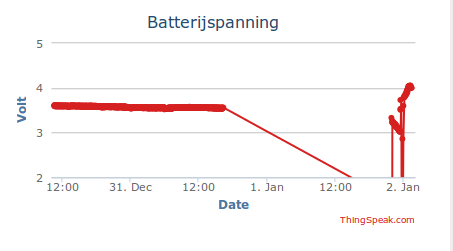 Resetting the Wemos did not bring it back to life… which was not so surprising because when i measured the LiPo (this was almost a day after the sketch stopped working… I was busy shopping for Newyears Eve), it was at 1.3 Volt. A quick connection to a USB port brought it back to life. A very strange finding indeed that warranted me to repeat the test (See below). 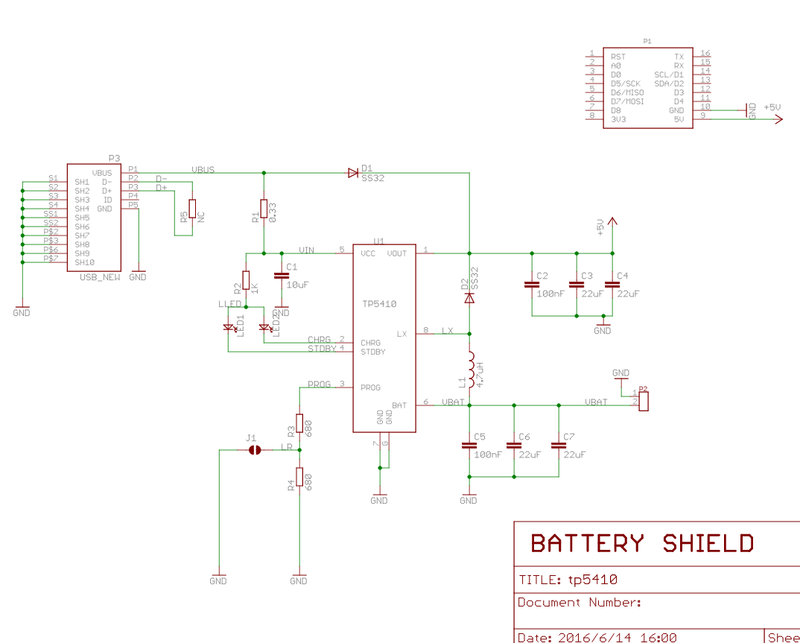 But for now it doesnt seem like the battery shield is the best solution for a serious battery dependend project. As said before, the Wemos D1 Mini, also is not the most suitable for a battery operated project. True, the ESP8266 can be put to deepsleep and will only use around 77uA, but the Wemos board also has the CH340 FTDI to TTL chip on board. As that is directly connected to the 3.3 Volt line, it will always be active, drawing around 50uA which is sort of in the same ballparc as the ESP8266 itself. Without that CH340 it could operate 1.6 times longer. Apparently Harald has a more positive experience with the shield. Thanks for the review. That cell going down to 1.5 volt is scary, but maybe that was the protection circuit in the cell shutting off? It usually does @ 2.5 volt and just the tiniest leak could have given you that voltage on the meter. I agree on the shield not being the best thing since sliced bread. Boost-converting and then using an LDO seems quite horrible for a battery operated project. If your ESP goes down to 2.9 volt, the best strategy might be to get the best LDO you can find and keep the cell nicely charged as much as you can. Or even better, be brave and just hook it up to the 3.3. rail with a 1 amp rated 3.7 volt or so zener diode across and let the cell never go over that way. Would make for a VERY long lasting battery if if has a protect circuit too. Thanks Jeroen, Could very well be the protection kicking in, nevertheless definitely too low. Thing is though that a very brief connection to USB made it all come alive again and within seconds the cell was at higher voltage. Your suggestion is a good one, but when the zener kicks in obviously some load will get lost. Not sure if an LDO (I ordered some with very low drop) would be more efficient. Will have to do some tests. Most sensors work on 3v3 anyway. Force can reach 1A. No external keys needed to plug and play. Load power, ripple, stronger drive capability, and higher efficiency. Thanks for yr input. Indeed the chinese datasheet says ‘锂离子’ which is Lithium Ion, but as my chinese knowledge of chemical names has become a bit rusty (I am not kidding), I wasnt quite sure if that was the correct translation. As Wemos advertises it as a ‘Lithium battery shield and sometimes even as a LiPo shield’ I presumed they knew better than I did. The confusion become even bigger because LiPo batteries are often referred to as Lithium Ion Polymer batteries (Adafruit for instance does that). I am not sure if it makes a difference for the charging, but as I have a LithiumIon battery as well, I will give that a try. It also doesnt explain the 3.5-3.6 V cutoff though as it should go into trickle charge at 2.9 V. Having said that, I am retesting the LiPo battery/shield and the voltage is now at 3.26. Hi! Great article – I was wondering: What exact battery did you use and how did you connect it? Thanks! Is it possible to used shield as ups for d1 mini? Thanks for the review. Why the battery shield drops to 1.5V is because some of LiPo batteries does not have an under voltage protection (which is should into the device or a drone). And if you look at the schematic, the VBAT is connected to the +5V through one inductor and one diode. Yes, the TP5410 will go into sleep mode below 2.7V, but that also means in D/C mode, the inductor is acting as a short circuit between the VBAT and +5V, and as the result, the +5V line will have a voltage = VBAT-Vf(of the diode). What you really need is a Lithium battery with built-in over and under voltage protection to replace your old one. Other than that, the battery shield is fairly efficient, TP5410 has a efficiency between 85-90%. If you choose any buck/boost converter, the efficiency is going to be worse. The LDO ME6211 on the WeMos D1 board is also very effective at suppressing noise coming from the boost converter, and gives a very clean supply for the ESP8266. IMO, TP5410 + ME6211 is a fairly cost effective way to provide a 3.3V from a Lithium battery. As a compromise, we can monitor the A0 ADC line, and shut down the ESP8266 when VBAT drops below 3.0V. Proper battery protection is still the preferred method. David, I fully agree with what you say. It would have been nice if the board would have had under voltage orotection, but alas it doesnt. The TP5410 indded is fairly efficient. My main issue though was not as much with the board itself, as with the fact that it might not be best choice for battery feed in which it is solely depending on battery feed. But in that aspect the Wemos itself isnt: a bare bones ESP8266-12+LDO, perhaps with a battery protection charger module, would be better, efficiency wise. If I had to build a project needing this now, I would use just a TP4056 indeed for charging (as per Andreas Spiess testing lots of PCB’s / solutions), and, brace please, hook up the ESP directly to the cell. I read an atricle the other day 4.2 does not destroy the ESP (it might shorten it’s life a bit), but it does substantially increase it power usage. GREAT 😉 That will pull the voltage quickly out of the danger zone and make the cell live longer. For under-voltage protection I would simply ESP.getVcc() and basically go into endless sleep (ESP.deepSleep(0, WAKE_RF_DEFAULT);), of course not after sending out a “feed me please!! !” MQTT message. The most efficient solution I’ve found so far is to use a 3.3v buck converter, like the LM3671, the charge pump is also disabled when Vin drops below 3.3v and Vout will just be the same as Vin, and continue to power the ESP8266 until the battery protection circuit kicks in. I have also done a few projects that requires a battery shield, anything that requires a 5V input, the battery shield is a good solution. Where is the problem of connecting a 18650 (protected) battery directly to the 5v on the WeMos Mini? Is has the LDO which supports 4.7-3.8 Volts. There is no problem with that, but I was just reviewing the battery shield. Hi! That is a good review! I have a question if you don’t mind, but is not related to power management but to usb connection. Having this battery shield module mounted on a dual base shield (next to a D1 mini, of course) I was unable to connect my D1 mini to computer (through battery shield). It looks like the usb port of the battery is only for charging not also for usb communication. This is the normal behavior or my board have an issue? I must mention that my board is exactly as the one reviewed by you, version 1.1.0, now retired. I have 3 psc from one firm, and on all boards after connect to D1 mini voltage 5Vpin going down to 2,6v. ( tested on 4 different D1 mini boards). I have to make test on battery board from another suplier. resolved. All Wemos Battery boards had bad soldering about IC. What resistor did you connect to A0 for measuring the battery voltage? Ironically, they also did something right that’s rare: the wiki pages have links to the previous versions of the boards. So, if you have boards you bought a couple of years ago, you can get schematics for them.